We kicked off the 2018 Texas Tribune Festival with an interview of the former secretary of state. Kerry answered questions about foreign policy, the Brett Kavanaugh hearings, 2020 and more. 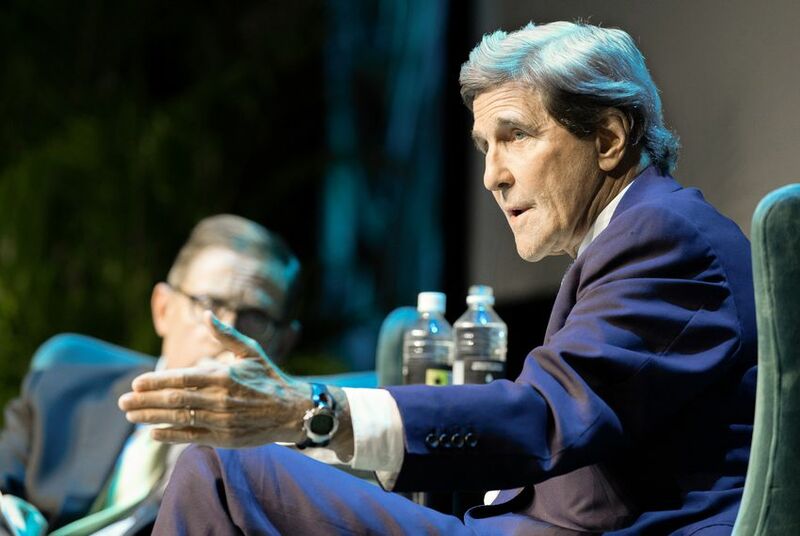 In a wide-ranging conversation with Tribune CEO Evan Smith, Kerry lamented a system of divisive partisan politics while launching a series of jabs at President Donald Trump. And Kerry, a Democrat who in 2004 lost a tight presidential election by one state, Ohio, did not rule out running against Trump in 2020. He pointed to a decline in voter turnout for presidential elections — just 54.2 percent of eligible voters cast ballots in 2016, he said, down from 58 percent in 2012 and 62.3 percent in 2008 — and called on those frustrated with the current system to work to change it in November and beyond. Kerry had harsh words for the current administration, which he has often found himself at odds with — including in a recent scuffle over the Iran Nuclear Deal, which Kerry helped craft during President Barack Obama's administration and which Trump has abandoned. Trump and Secretary of State Mike Pompeo have criticized Kerry for meeting with Iranian leaders after leaving his State Department post. Kerry dismissed those criticisms, saying he did nothing inappropriate. World leaders know to wait out the Trump administration, he said. In particular, Kerry excoriated the administration’s handling of the confirmation process for U.S. Supreme Court pick Brett Kavanaugh, whose nomination is set for a vote in the Senate Judiciary Committee Friday morning after a highly contentious, highly emotional hearing Thursday over sexual assault allegations against the longtime federal judge. The longtime statesman identified two major flaws in the current political system: an influx of influential cash from special-interest groups and a set of political maps that disenfranchise some voters. "There is far, far too much money in American politics, and it's distorting the system," Kerry said. And "we cannot even have a legitimate, democratic general election in the U.S. because of gerrymandering." "When [Trump] says ‘the truth, the whole truth and nothing but the truth,’ he means three different things," Kerry joked. "This is a president who called himself a stable genius the other day — which means [special counsel Robert Mueller] has him on two counts of perjury."